Brampton Plate & Structural Steel Rolling Inc. is a progressive family owned Canadian company offering Custom Steel Cutting, Rolling, Forming, Welding, Fabricating and CNC Machining. Established in 1984, Brampton Plate continues to prosper, due to the patronage of existing and new customers. Brampton Plate is committed to helping our customers achieve their goals by offering consistently fast response time, expert advice and guidance. Training, knowledge, and experience from over 25 years of servicing the diverse needs of the Canadian and American industry, gives all of Brampton Plates employees the expertise to handle customers requirements. Brampton Plate configures products with a computer aided design (CAD) system. 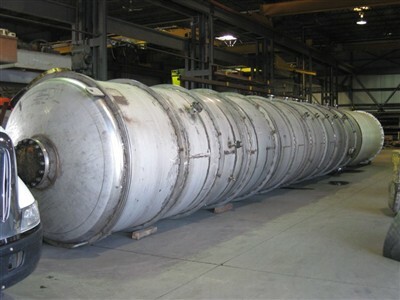 We produce pressure products, heat exchangers, tanks, towers, cylinders, cones, elbows square to round shapes, large and small steel products customized to our customers specifications. Our wide range of capabilities and modern equipment put us in the forefront of our field. Brampton Plate and Structural Steel Rolling Inc. are committed to maintaining a documented quality system to ISO 9001:2008, TSSA and CWB specifications, as a means of ensuring our delivered products and services conform to specified customer requirements. To achieve, maintain, and to seek to continuously enhance the quality of our products and services in relationship to the requirements or quality. To improve the quality of our own operations, so as to continually meet all customers and other stakeholders stated and implied needs. To provide confidence to our internal management and our employees that the requirements for quality are being fulfilled and maintained, and that quality improvement is taking place. To provide confidence to our customers and other stakeholders that the requirements for quality are being, and will be, fulfilled and achieved in our delivered products and services. To provide confidence that the quality system requirements are fulfilled.